Foodista has partnered with Chef Elana Horwich of Meal and a Spiel to share her favorite Passover recipes. Matzo ball soup is a classic and a must-have at your Passover sedar. 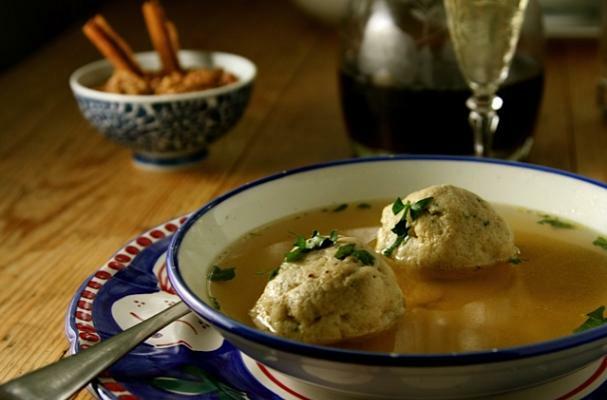 These matzo balls are made with schmaltz (rendered chicken fat) giving them a boost of flavor. You can purchase schmaltz at a Jewish market or wherever Kosher products are sold. Makes 12 medium sized matzo balls. Note: Start this recipe the day before you plan to serve it. If it is already too late, plan on chilling the matzo ball mix for at as long as you can, three hours at least. In a small pot, add the 4 tablespoons of homemade chicken broth and set over medium flame until it is reduced in half to 2 tablespoons. Pour into a glass and set in fridge until it reaches room temp. Whisk eggs, 1 ½ teaspoon salt, pepper, ginger and chopped herbs in a bowl until well mixed. Stir in matzo meal and reduced chicken broth. Add duck fat or schmaltz and stir in well. Cover with plastic wrap and put in fridge overnight. In a large pot, set 5 quarts of water along with the boxed or homemade chicken broth, carrot, celery and parsley or dill over a high flame and cover until it comes to a boil. Add a small handful of salt to the boiling water/broth as if it were pasta water...it should taste salty like the sea. Using wet hands, form the matzo meal into imperfectly shaped balls, about 1 ½ inches in diameter. Place each one in the boiling water/broth. Stir to make sure they don’t stick. Cover and cook for 50 minutes. Cut one open to make sure it is fully cooked. If not cook them for a few minutes more. Lift out of water with a slotted spoon and place one or two in a serving bowl. Ladle homemade chicken broth into each bowl. Optional: garnish with a little chopped parsley or dill. Note: If you are not serving them immediately, just keep drained matzo balls in a covered glass bowl until you are ready to use them.